This is a Korean name; the family name is Yi. Yi Hwang (李滉, 이황 1501-1570) was one of the two most prominent Korean Confucian scholars of the Joseon Dynasty, the other being his younger contemporary Yi I (Yulgok; 이이; 李珥). Yi Hwang is often referred to by his pen name Toegye (退溪, 퇴계; "Retreating Creek"or "Ebbing Brook"). His courtesy name was Gyeongho (景浩, 경호). 3.2 "Twelve Songs of Tosan"
Yi Hwang began his Confucian studies early, succeeded in the civil service examinations, and served in the Joseon court and bureaucracy for most of his life, holding 29 government posts. In 1544, Yi turned his back on court politics and returned home to the Tosan Valley in southeast Korea to devote himself to his philosophic studies. At that time he began to build the Dosan Seowon, a private Confucian academy which was officially opened after his death in 1574 and is still in existence today. Yi Hwang is called “eastern Confucius” or “small Confucius.” Following the concepts of Zhu Xi, he elaborated a Confucian “li-chi” theory in which moral and ethical principle had primacy over material force. Yi Hwang’s most famous work is Ten Diagrams of Sage Learning, a distillation of his Confucian thought. His Twelve Songs of Tosan, written when Toegye was 64 years old, is a cycle of verses celebrating the rhythms of nature and examining the essence of the human condition. He is still regarded as Korea’s foremost philosopher. The Society of Toegye Studies is an international academic organization with members worldwide. During the Joseon Dynasty, which ruled from 1392 until the Japanese annexation of Korea in 1910, a Confucian ethical system was officially adopted in place of Buddhism, which had become corrupted over the centuries. Society was dominated by the yangban, a hereditary aristocratic class of scholar-officials who controlled most of the land. The yangban system included civil service examinations to select the best scholars for public office, and therefore encouraged scholarship. In 1420, a royal academy called the Hall of Worthies (Chiphyonjon) was established. Sejo (1455 -1468), the seventh monarch, established a powerful centralized government administration; the country was divided into eight administrative provinces, all officials were appointed by the central government, and laws were codified. Late in the fifteenth century, Korean intellectual life was flourishing, and scholars made original contributions to the refinement of Confucian theory. Many of these Confucian scholars were recruited into government service in the mid-sixteenth century, but because of their idealism, they were highly critical of the bureaucratic establishment and recommended drastic reforms. Most of them were eventually forced by political pressure to retire from their posts, and established private called sowon. These academies produced many eminent scholars, including Yi Hwang (T'oegye) and Yi I (Yulgok). In 1234, movable-type printing was developed in Korea, allowing the publication and dissemination of many texts in the fields of medicine, astronomy, geography, history, and agriculture. The invention of Hangul (han'gul), a native Korean writing system, in 1443–1444, during the reign of King Sejong, initiated a new era in Korean literary history by enabling Korean writers to record works in their native language. During the early Joseon Dynasty, poetry was predominant. The two most important forms of early Joseon poetry were sijo and kasa. The brief and simple sijo were vehicles for intense lyrical expression, and the longer kasa allowed writers to express themselves at greater length on practical aspects of Confucian thought. Sijo often concerned themes such as the union of man and nature, the longing for sovereigns by subjects in exile (often comparing fidelity and romantic love), and the problems for human life. Yi Hwang was among the best-known writers of sijo. Yi Hwang (literary appellation T'oegye (Stream Hermit))was born in On'gye-ri (now Dosan), Andong, North Gyeongsang Province, on November 25, 1501. He was the youngest son of scholar Yi Sik, whose death seven months after Yi Hwang's birth plunged the family into poverty. Yi Hwang was a child prodigy; at the age of six, he started to learn the Book of One Thousand letters from an old gentleman in his neighborhood. At 12, he began to study Analects of Confucius with his uncle, Yi U, in preparation for the government civil service examinations. His ability attracted the attention of his elders, and he is said to have loved the poetry of T'ao Yuan-ming, the outstanding post-Han era nature poet of China. At seventeen, Yi began his study of the Confucian commentaries of the Song (Sung Dynasty; 宋朝) Neo-Confucian philosopher Zhu Xi (Chu Hsi). At the age of 19, he obtained the two-volume Seongni Taejeon, a great compendium of neo-Confucianism by Hu Guang, and experienced a process of great awakening. He became devoted to Song thought. Around his twentieth birthday, Yi was initiated into the mysteries of the Book of Changes (I Ching) and is said to have injured his health and even neglected to eat while pondering the philosophy of change. At 21, Yi married, and his first son was born two years later. Whne he was 23, he went to Seoul to study at the National Academy. In 1527, he passed the Kyngsang provincial qualifying examination, and the next spring he passed the metropolitan examination, placing second and earning his literary licentiate degree. His wife died a few months before his success. In 1530, he remarried, and another son was born the following year. In 1534, Yi passed the preliminary provincial civil service examination with top honors, continuing his scholarly pursuits whilst working for the Joseon government, and was appointed to office in the Royal Secretariat. However, he was unable to advance in his career because of opposition from a faction led by Kim Anno. Yi held various minor posts until, in 1538 his mother died. In accordance with Confucian custom, he left the government for an extended period of mourning, and while he was away, Kim Anno's faction fell from power. There were no further political obstacles in Yi's official career, and he was simultaneously given a post in the Office of Special Counselors and in the prestigious Office of Royal Lectures. Throughout his life, Yu held 29 government positions. He was known for his integrity, and relentlessly took part in purges of corrupt government officials. In one report to the king, following an inspection tour of Chungcheong Province as a royal secret inspector, he ruthlessly condemned a provincial official who, ignoring an order from an honest magistrate, had illicitly built a fortune by taking possession of government articles. On numerous occasions his firm commitment to principle brought about his exile from the capital. In 1544, Yi was appointed assistant headmaster of the National Academy, but he left office shortly thereafter and returned to his home, turning his back on court politics to devote himself to his philosophic studies. At that time he began to build the Dosan Seowon, a private Confucian academy offering instruction in the classics and honoring the sages with regular memorial rites. Five years later, Yi was made headman of Tanyang county, a position which provided him with a stipend away from the political rivalries of court. When his elder brother, Duke Taehn, was made chief magistrate of the province, propriety obligated Yi to request a transfer to P'unggi county in Kyngsang Province, to serve as headman there. The next year he petitioned the chief magistrate to relieve him from duty, and when his request was granted, he retired once again to the west bank of T'oegye Stream and devoted himself to philosophical studies. At the age of 52, Yi was recalled to the capital to be the headmaster of the National Academy. Though he repeatedly requested to be relieved because of his failing health, he served as Minister of Works, Minister of Rites, and chancellor of the Office of Royal Decrees. In 1569 he returned to his home in Andong in poor health. The next year he passed away. On his death, Yi Hwang was posthumously promoted to the highest ministerial rank, and his mortuary tablet is housed in a Confucian shrine as well as in the shrine of King Seonjo. In 1571, the King conferred the posthumous title of Mun Sun (Pure Word) upon him. The Dosan Seowon (or Tosan Sowon) Academy in Kyngsang Province was officially opened in his honor in 1574, and has remained active until this day. Toegyero, a street in central Seoul, is named after Yi, and he is depicted on the South Korean 1,000-Won note. The Taekwondo pattern Toi-Gye was named in honor of Yi Hwang. Yi Hwang was the author of many books on Confucianism, and he also published a "sijo" collection, a short poetic form popular with the literati of the Joseon period. During 40 years of public life he served four kings (Junjong, Injong, Myeongjong and Seonjo), and his interpretation of the "li-chi" dualism gained him fame in Korea and abroad. 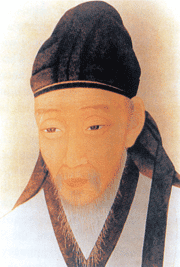 Under the influence of Yi Hwang (T'oegye), Yi I (Yulgok), and other Korean scholars of the fifteenth century, the commentaries of the twelfth-century Chinese scholar Zhu Xi (Chu Hsi) on the Confucian canon, and his interpretations of Confucian principles, became the orthodoxy of Korean Confucians. In Korea, as in China, Zhu Xi (Chu Hsi)’s interpretation became the standard for government examinations, with occasional challenges by new interpretations from philosophers such as Wang Yang-ming and Lu Hsiang-shan. The two major Confucian schools in Korea were the Yi Hwang’s Yngnam school,in Andong in North Kyngsang Province; and the Kiho school, led by Yi's contemporary Yi I (Yulgok; 이이; 李珥). Both schools were factions of the Korean School of Nature and Law, but they differed substantially in interpretation. Yi T'oegye developed a dualistic “li – chi” cosmology. A third contemporary, S Kyngdok, evolved a monistic cosmology, and Yi Yulgok's group, a middle ground. Yi Hwang endorsed Zhu Xi's dual theory of li (Korean, i; "principle") and qi (Korean, ki; "material force"), but questioned the nature of Zhu Xi's priority of principle over material force. Yi concluded that principle, which he identified with original nature and the moral mind, was superior in value to material force, which was simply physical. In a famous debate with Ki Taesung (1527–1572) on the sadan (Chinese, ssu-tuan; "four beginnings") and the ch'ilchong (Chinese., qi-qing; "seven emotions") Yi proposed that the feelings of commiseration (beginning of humanity), shame and dislike (beginning of righteousness), deference and compliance (is the beginning of propriety, and right and wrong (beginning of wisdom) were initiated by principle (li). The Seven Emotions of joy, anger, anxiety, pensiveness, grief, fear and fright belonged to the realm of material force (ki). Yi Hwang believed that principle had a generative power of its own. This position became a focus of the scholarship of the Yŏngnam school. Yi Hwang (T'oegye) believed in the need for daily moral cultivation, a slow and painstaking process. Knowledge, which could only be acquired through laborious inquiry and meditation, with an attitude of sincerity and reverence. The meditative quality of his scholarship remained a distinctive feature of the Yŏngnam School. Their Way before me, can I but follow." Yi also wrote Tosan Records, a diary of his recollections at Tosan. Yi Hwang’s last great work, Ten Diagrams on Sage Learning, was perhaps his most popular work. It went through some 29 printings during the Yi Dynasty, and is now available in at least three modern Korean translations. "Sage Learning" was a genre of Neo-Confucian literature designed for the instruction of rulers by using the examples of the ideal sages of the past. Yi Hwang composed “Ten Diagrams” in 1568 for the young King Sŏnjo, when he was too old and ill to continue instructing him in person. Traditional Confucians had affirmed that any man could learn to become a sage; the new Confucians elaborated a detailed metaphysical and psychological framework that made the ideal of sagehood real and attainable, just as enlightenment was for Buddhists. The term "sage learning" in the title signifies that Yi Hwang intended to present that path. “The Ten Diagrams” is intended for repeated reading and reflection. Each of its ten sections or chapters begins with a diagram and related text drawn from Zhu Xi (Chu Hsi) or another leading authority, and concludes with a brief commentary by Yi Hwang. He intended for “Ten Diagrams” to be made into a ten paneled standing screen, as well as a short book, so that the mind of the viewer could be gently but constantly engaged with its contents, until it totally assimilated the material. Yi Hwang carefully arranged materials that he had long used in his teaching and personal life. The first five chapters present a view of the universe (metaphysics), society (ethics), and their import for human life (learning). The remaining five chapters deal directly with self cultivation, the "learning of the mind and-heart." They start with an analysis of man’s inner life (psychology) and conclude with directions for ascetic practice. Learning is depicted as a process of self-transformation. The chapters on Elementary Learning and Great Learning describe the continuity of the learning process from youth to adulthood. Elementary Learning emphasizes the Five Relationships between parents and children, husband and wife, elder and younger, superior and subordinates, and friend and friend. Great Learning develops the principle and the steps of practical self-cultivation and its expansion to include all of society. The third chapter on learning presents the Five Relationships not only as the foundation of learning, but as the object toward which all study and practice are ultimately devoted. Blind men will not see it. ↑ Sŏnghak sipto (Ten Diagrams on Sage Learning), Seoul: Hanguk Chŏngshin Munhwa Yŏn'guwŏn, 1980. Retrieved September 25, 2007. Kalton, Michael C. 1988. The way of Korea. Seoul: International T'oegyehak Society. Yun, Sa-sun. 1990. Critical issues in neo-Confucian thought: the philosophy of Yi T’oegye. Seoul: Korea University Press. Rules of the White Deer Hollow Academy and comments by T'oegye. Detailed bibliography – (in English, Korean encoding needed). This page was last modified on 29 July 2013, at 14:37.